1. The game is played with a king and four defenders against eight attackers. They start the game laid out in brandub. 2. In each turn, a player may move a piece as far as desired along a row or column. 3. No piece may jump over nor land on another in the course of its move. 4. 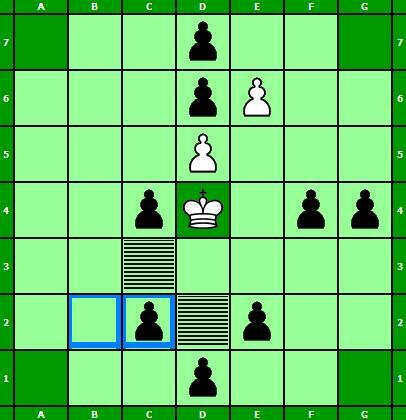 Only the king is allowed to land on the marked central space. Other pieces may pass over the central square when it is empty. 5. A piece is captured by surrounding it on two opposite sides along a row or column by two enemies. 6. A piece may also be captured by surrounding it between an enemy and one of the marked corner squares. 7. 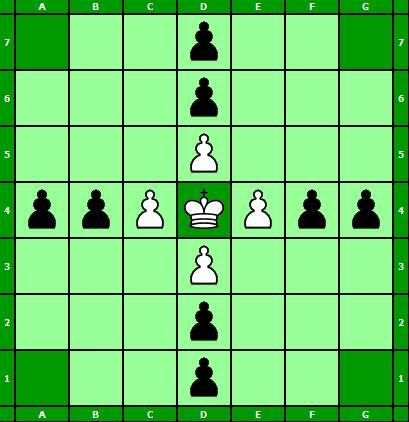 It is possible to capture two or three enemy pieces at once, if all become surrounded against separate enemies in the same move. 8. The king is forbidden to take part in capturing enemy pieces. 9. The defenders win the game when the king reaches the edge of the board. 10. The attackers win the game when they capture the king.